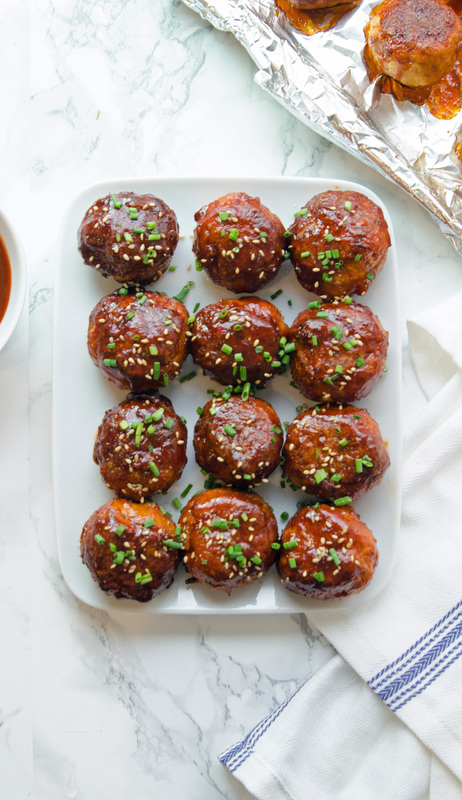 Spicy Korean Chicken Meatballs are healthy yet full of flavor with garlic, ginger and gochujang paste. They are easy to make, versatile, reheat and freeze well. Meatballs are a staple protein in our house. 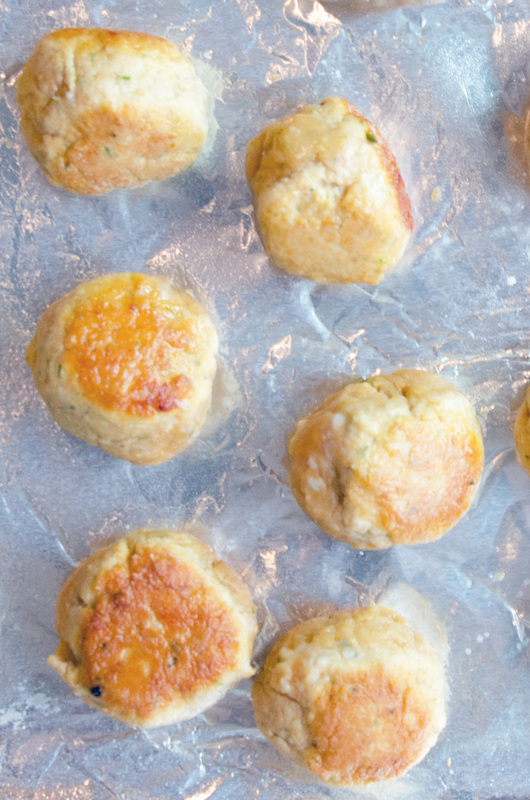 Besides being delicious, they are easy to make, versatile, reheat and freeze well. This means you can make a big ole’ batch, eat some freshly made meatballs and then save the rest for later. I normally cook a double batch of these meatballs so I can make a few freezer meals. While the meatballs s are cooking, I make a batch of brown rice. Then, I freeze individual servings for weeknights when I don’t have time to cook. 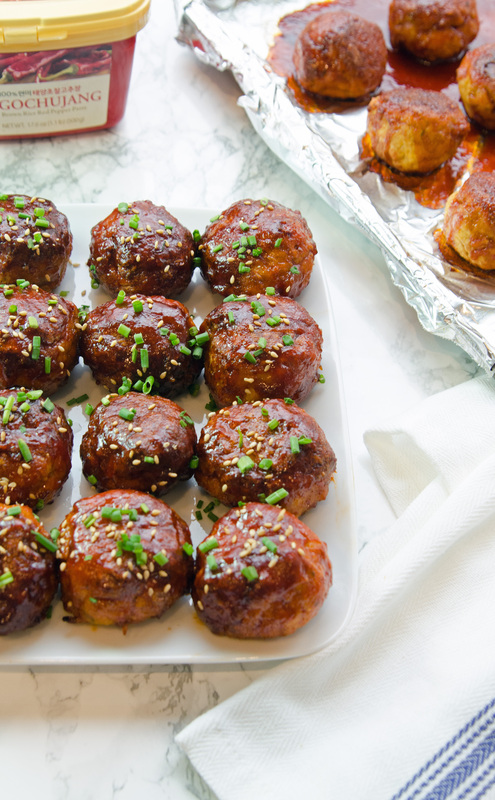 These meatballs are extremely versatile. I use these in lettuce wraps, over noodles or served with a whole grain to make a Buddha bowl. They also make a tasty sandwich on a fresh baguette with some shredded carrots, cilantro, and red onions. You can make a large batch of these meatballs, change up how they are served and you won’t get tired of eating them. If these meatballs did the dishes you might want to marry them. Yes, they are that amazing. If you follow me on Instagram and watch my stories, you know I’ve been working on this recipe for a while. 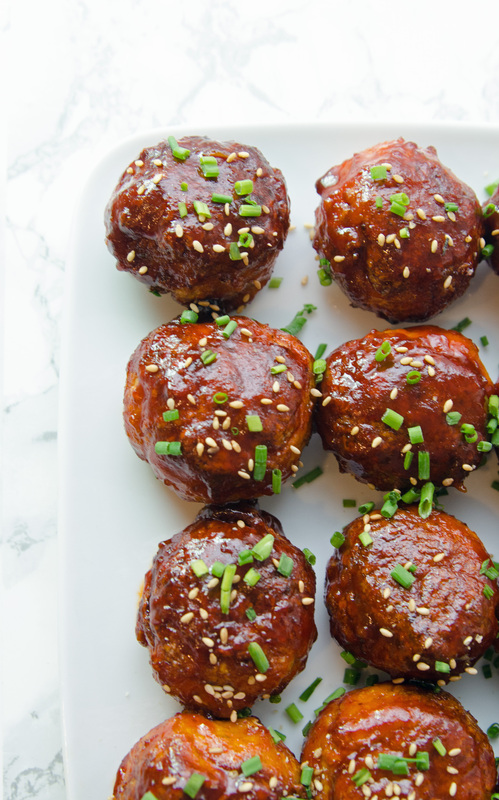 It took a few test runs to get these spicy Korean chicken meatballs just right. Originally, I was using pre-ground meat (which is still good) but by using my food processor to grind the meat and blend the ingredients, I think the meatballs have a better texture and flavor. Also, I have control over the chicken I use, which is half breast and half thigh meat. The key ingredient in this recipe is gochujang paste. Gochujang paste is also called chili paste. It is a savory, sweet, and spicy condiment. Chili powder, glutinous rice, fermented soybean powder, barley malt powder, and salt are fermented giving it a unique flavor. If you can not find gochujang paste in your store, you can substitute sriracha mixed with soy sauce and splash of balsamic vinegar. See the recipe for further details. In a saucepan combine ingredients and bring to a boil. Reduce heat and simmer for 2-3 minutes. 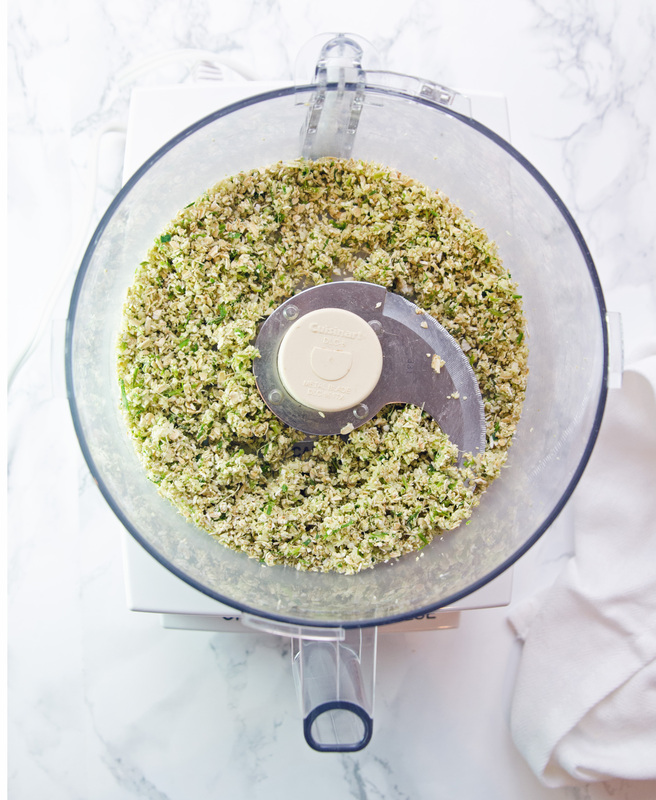 In a food processor add garlic, ginger, oatmeal, salt, pepper, scallions. 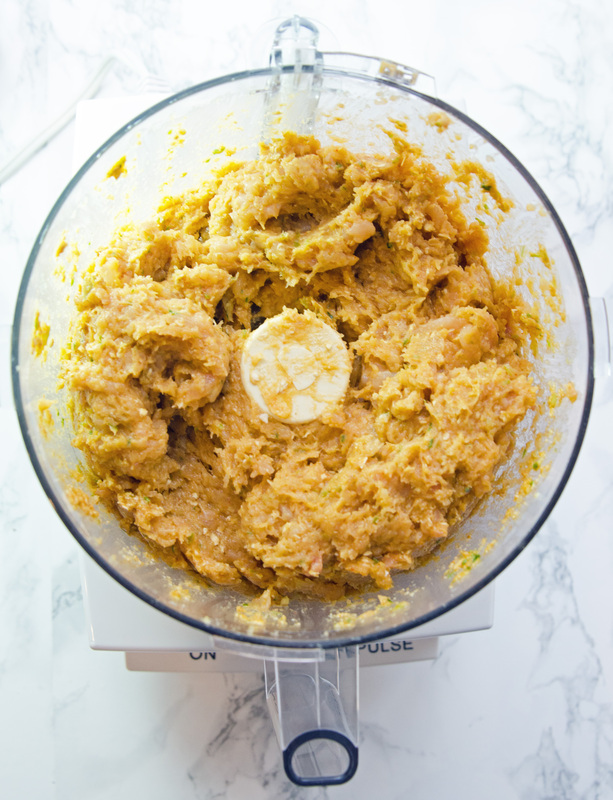 Pulse food processor until mixture is coarsely ground. Add egg and gochujang paste. Pulse 2-3 times until combined. 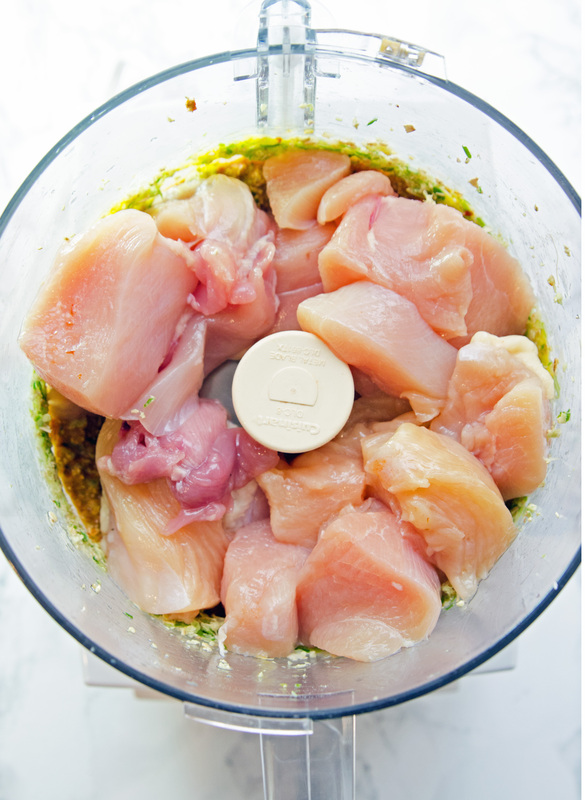 Add chicken and grind for 15-20 seconds, until chicken is ground and ingredients are combined. Portion out into 1-2 oz balls. 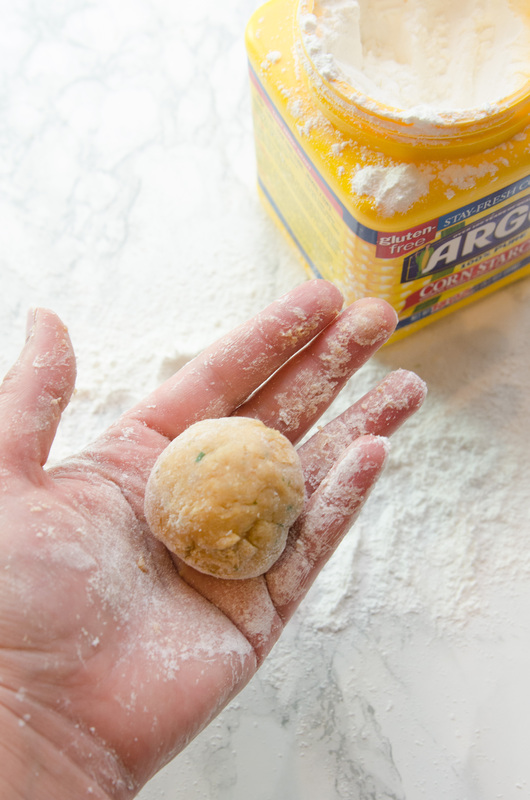 Dust hands with cornstarch and roll mixture into smooth balls. In a large skillet, heat sesame oil on medium heat and turn to low. Add meatballs and cook for 1-2 minutes on each side until lightly brown. 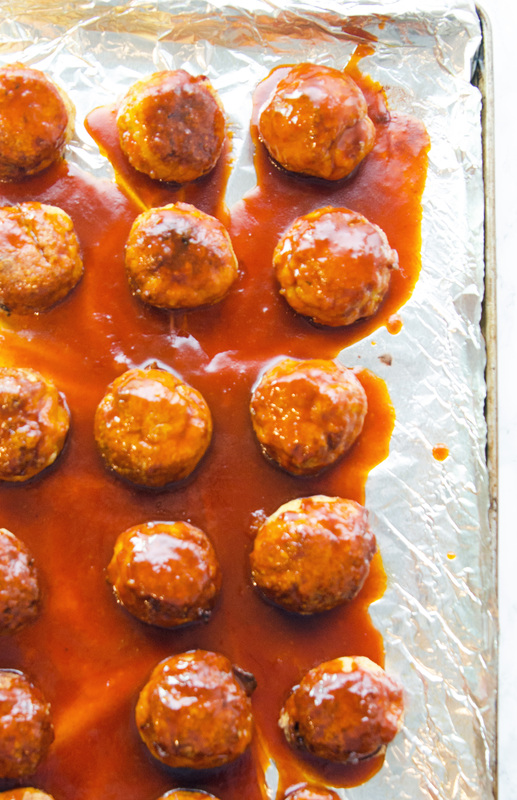 Remove meatballs from pan and place on a greased foil-lined baking sheet. Remove from oven and dip each meatball in the sauce and place back on the baking sheet. 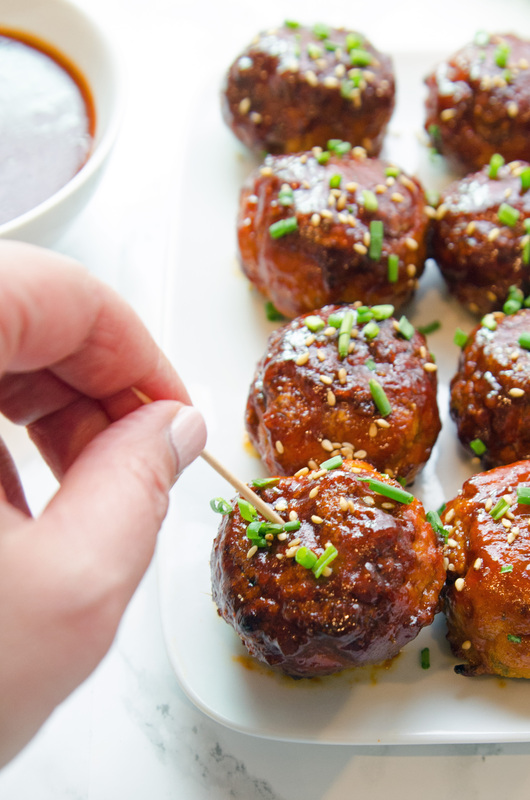 Garnish meatballs with green onions and toasted sesame seeds. Serve with remaining sauce. If you prefer you can use pre-ground meat. Turkey, pork or beef can be substituted in this recipe. 1. 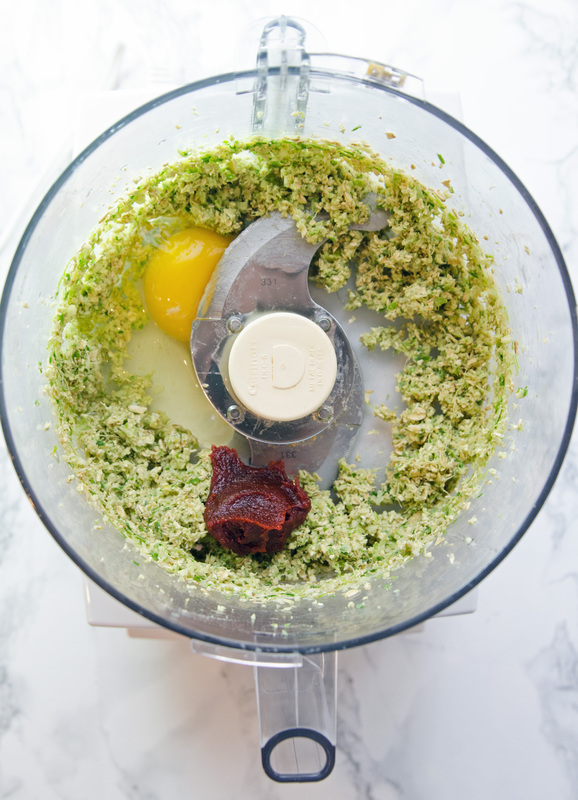 Grinding the meatball is a three-step process. Step 1 – start with the garlic, ginger, oatmeal, salt, pepper, scallions. 2. The next step, add wet ingredients. 3. The final step to grinding the meatball mixture is to add the cubed chicken. 4. Do not over grind. Seeing flecks of oatmeal, ginger and garlic are a good thing. 5. Roll your meatball in A VERY LIGHT coating of cornstarch. I put a dusting on my hands. 6. Don’t over fry the meatballs. You want them to firm up and become a light golden brown. 7. 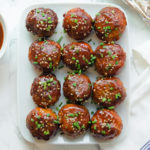 Baking the meatballs for a few minutes with the sauce takes these meatballs to a whole new level. 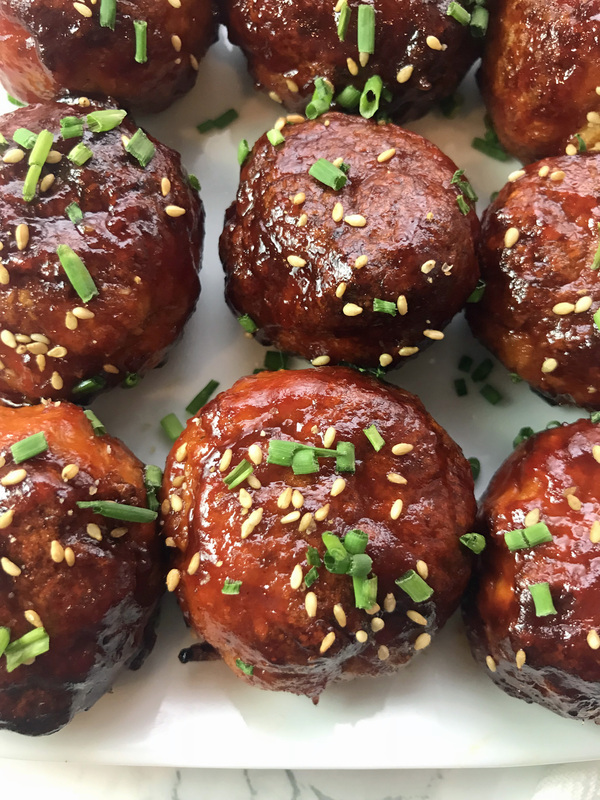 The sauce gets a rich dark red and gives these meatballs a sticky glaze.